Talk about colors! This is intense. can\'t wait to see the new shots – sure they are excellent. Welcome back!!! Love this shot. Aside from the vivid colors, I like the shapes of the Cathedral. Looking forward to the new pix from Russia! I want to go to Russia so much. The story behind "Saint Basil Cathedral on Red Square, Moscow"
I am back :) Sorry for the long dry spell, but I was busy leading a team in Russia. Of course I took my camera, so the next week or so I will post some images of the largest country on earth, starting of with the most famous sight: St Basil’s cathedral at Red Square. In the front of the cathedral stands a bronze statue commemorating Dmitry Pozharsky and Kuzma Minin, who rallied Russia’s volunteer army against the Polish invaders during the Time of Troubles in the late sixteenth and early seventeenth centuries. The statue was originally constructed in the center of Red Square, but the Soviet government felt it obstructed parades and moved the statue in front of the cathedral in 1936. The initial concept was to build a cluster of chapels, one dedicated to each of the saints on whose feast day the tsar had won a battle, but the construction of a single central tower unifies these spaces into a single cathedral. Legend says that Ivan had the architect, Postnik Yakovlev, blinded to prevent him from building a more magnificent building for anyone else. 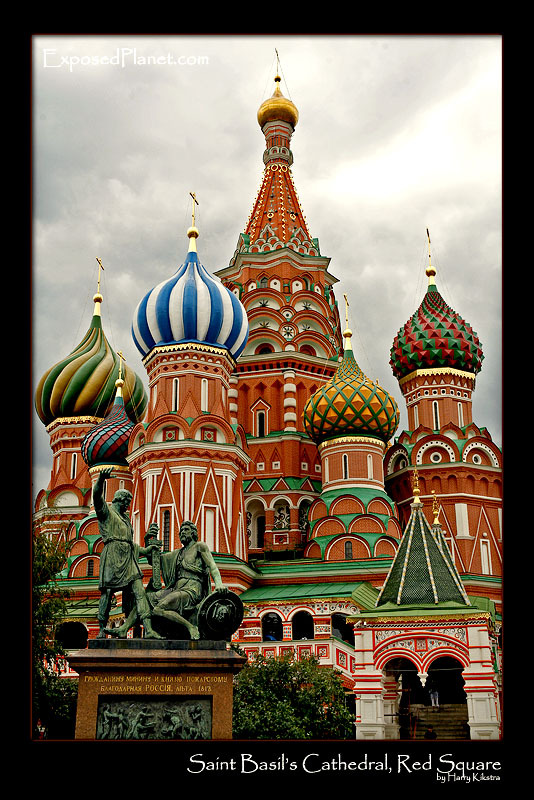 Saint Basil’s Cathedral should not be confused with the Moscow Kremlin, which is situated right next to it on Red Square. It is not at all a part of the Moscow Kremlin. However, many publications do make the mistake of calling this structure the Kremlin. The misconception has inadvertently been reinforced by Western television journalists, who have often stood in front of St. Basil’s during their reports.